Stuarts Rachael gave birth today (5/2/01) 10.59am to Harrison (hereafter Harry) - 9lb 3.5 oz, 22 inches long. He has long black hair and a dimple. Graham (other grandfather) I think it was who said Harry looked like a miniture me without the moustache! There were no complications, though it was a long labour. We praise God for this new little life and share our joy with you. We went out to Wee Waa today and had a cuddle and took some photos, which we will send sometime. 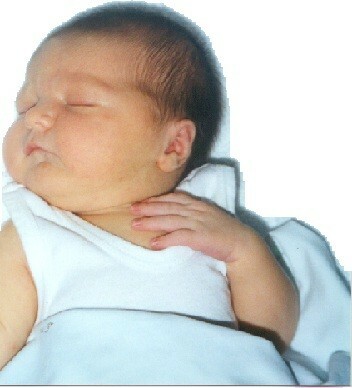 Harrison Grady Andrews has arrived into this world, 10:59am, Monday 5th February, 2001. Hes got all the right number of fingers, toes, thumbs etc, and weighed in at an impressive 9 pounds 3 and half ounces. Hes 22inches long, and has dark hair... and plenty of it! Mummy and baby doing fine, father more excited than words can ever express. All grandparents and great parents incredibly relieved, excited, blessed, thankful, joyous, exhausted, and smiles will not be subsiding for some time to come! BTW, this is the first GreatGrandchild on BOTH sides of the family, hence even more special for us all.... it begins!!!! And for obvious reasons, Aunty Katy, Unky Dunc and Aunty Laura are over the moon, with their darling little nephew. Almighty God, Omnipotent, Omniscient, Omnipresent, our Heavenly Father, source of all life and love. We beseech Thy blessing on -- Stuart and Rachel -- who have covenanted in Thy presence to live together as husband and wife. We pray that You will unite their hearts in true sympathy and love that their life together might be a shining example of Christlike affection, pure religion and consecrated joy. If in Your goodness You should bless them with children, make them adequate for all the testings and trials of family life and bestow upon them the grace and wisdom to bring up the little ones in the nurture and admonition of the Lord and in the ways of the Church of God. Dear Lord, we beseech Thee to bestow Thy Fatherly blessing on the families enriched by this union. May our homes be filled with Thy peace, and our lives be spent in Thy fellowship and service until we arrive at last to the blessing of Eternal Life. Again we would remember -- Stuart and Rachel --, praying that their love for Thee and for one another may ever grow sweeter and stronger until in the evening of life, when the shadows lengthen and the day darkens one has to lay the other to rest. O Lord may it be with the joy and confidence that "underneath are the Everlasting arms" upholding and keeping until that Great Day when both join together in Thy presence to sing praises to, and worship "the Lamb slain from before the foundation of the World", our Saviour.